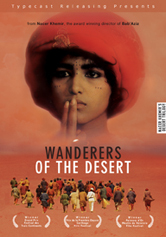 With Wanderers of the Desert, Tunisian writer and poet Nacer Khemir creates a visually hypnotic cinematic masterpiece, the first in his highly-regarded Desert Trilogy. When a young teacher arrives for a position at an isolated village school in the heart of the shimmering desert, mysterious events begin to unfold: Legendary figures materialize out of the village well and from the desert itself; groups of children hurry through a labyrinth of underground corridors; villagers gather around a ship that has mysteriously washed up in the desert sand; the young men of the village disappear one by one and never return. With a richly expressive visual style and superb use of color, director Nacer Khemir shows how legend, tradition, and fate hang heavily over this community, and how nothing is ever quite what it seems.